Here's a card April made. It's from the cartridge Sentimentals. 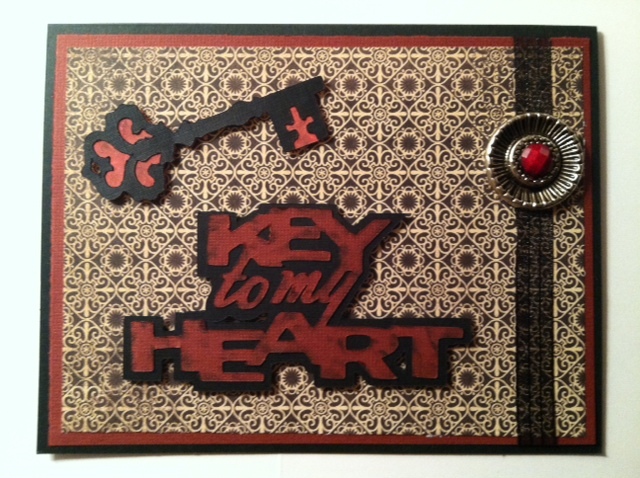 I really love the key design and the paper, so pretty! It was a pretty simple card to make. The key and sentiment is from Sentimentals. The black cardstock is Recollections. The red and patterned paper is from Recollections Union Square. Added some ribbon, button and a Paper Studio Gemstone. We're getting closer to our "200 Follower Giveaway". Thanks so much to everyone who follows our blog and leaves such sweet comments. We truly appreciate you! Beautiful card April. I love the color choices. Great card - love the paper. beautiful card.Love the colors and key. with keys being so very popular w/the way you have it placed on the card and the intention, (not new of course) but the sentiment is still the same,..and WILL ALWAYS BE!